The potassium solubilizing microorganisms (KSMs) are a rhizospheric microorganism which solubilizes the insoluble potassium (K) to soluble forms of K for plant growth and yield. K-solubilization is carried out by a large number of saprophytic bacteria (Bacillus mucilaginosus, B. edaphicus, B. circulans, Acidothiobacillus ferrooxidans, Paenibacillus spp.) and fungal strains (Aspergillus spp. and Aspergillus terreus). Major amounts of K containing minerals (muscovite, orthoclase, biotite, feldspar, illite, mica) are present in the soil as a fixed form which is not directly taken up by the plant. Nowadays most of the farmers use injudicious application of chemical fertilizers for achieving maximum productivity. However, the KSMs are most important microorganisms for solubilizing fixed form of K in soil system. The KSMs are an indigenous rhizospheric microorganism which show effective interaction between soil-plant systems. The main mechanism of KSMs is acidolysis, chelation, exchange reactions, complexolysis and production of organic acid. According to the literature, currently negligible use of potassium fertilizer as chemical form has been recorded in agriculture for enhancing crop yield. Most of the farmers use only nitrogen and phosphorus and not the K fertilizer due to unawareness that the problem of K deficiency occurs in rhizospheric soils. The K fertilizer is also costly as compared to other chemical fertilizers. 1. Potassium solubilizing microorganism in evergreen agriculture: An Overview.- 2 Potassium as an important plant nutrients in sustainable agriculture: A State of Art.- 3 Growth promoting effect of potassium solubilizing microorganisms on some crop species 4. Role of rhizosphere microflora in potassium solubilization.- 5. The molecular mechanisms of KSMs for enhancement of crop production under organic farming.- 6 Mycorrhizal Fungi: Role in the solubilization of potassium.- 7 Diversity of potassium solubilizing microorganisms and their interactions with plants.- 8 Interactions between arbuscular mycorrhizal fungi and potassium solubilizing microorganisms on agricultural productivity.- 9. Can potassium solubilizing bacteria mitigate the potassium problems in India?.- 10. Mechanism of potassium solubilization in the agricultural soils by the help of soil microorganisms.- 11. Regulation of paddy physiology and antioxidant activities for alleviating salinity stress by potassium solubilizing bacteria.- 12 Can a Bacillus spp. enhance K+ uptake in crop species.- 13 Potassium solubilizing microorganisms (KSMs) and its effect on plant growth improvement.- 14 Dynamics of potassium and their bioavailability for plant nutrition.- 15 Potassium solubilizing microorganisms: mechanism and their role in potassium-solubilization and uptake.- 16 KSMs soil diversity, minerals solubilization, in relation to crop production and molecular mechanism.- 17 Potassium and its role in sustainable agriculture.- 18. Towards the soil sustainability and potassium solubilizing microorganisms.- 19. Potassium uptake by crop as well as microorganisms.- 20. 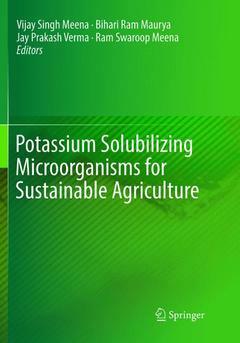 Potassium solubilizing microorganisms and their role in enhancing soil fertility and health.- 21. Potassium solubilizing bacteria and their application in agriculture.- 22 Rhizosphere microbes: Potassium solubilization and crop productivity – present and future aspects.- 23. Global perspective of potash for fertilizer production. Dr. Vijay Signh Meena is currently working as scientist at ICAR - Vivekananda Institute of Hill Agriculture, Almora, Uttarkhand, India.